Cook the sweet potatoes by poking holes all over it with a fork, then cook in the microwave for 7 to 10 minutes, until tender. Heat a medium skillet over medium-high heat. Add the meat and seasoned salt, and cook, breaking the turkey up into small pieces. Add the veggies. Reduce heat to medium and add the red wine vinegar, coconut aminos, and fish sauce. Cook for 4 or 5 minutes. Add tomato sauce, tomato paste, and water to the skillet and stir to combine. Cover, reduce heat, and simmer until the carrots are tender, about 15 to 20 minutes. 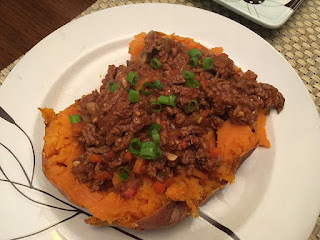 To serve, cut sweet potatoes, sprinkle with pinch of salt, and top with sloppy joe mix and green onions. Notes: This was hearty and delicious. The flavors went well together, and it really does taste like sloppy joes! Preheat oven to 400 degrees. Clean the beets and remove the leaves. Rub them with olive oil and wrap in an aluminum foil pouch. Place on a baking sheet and roast for 45 to 60 minutes, or until a knife poked into the center of a beet goes in easily. Remove the beets from the oven and allow to cool a bit. In a small bowl, mix the olive oil, balsamic vinegar, Dijon, and some salt and pepper to taste. Add the blueberries and muddle/crush them a bit so they are broken, but not too mushy. Peel the beets, and dice them into 1/2-inch pieces. Toss with the blueberry vinaigrette. Season with salt and pepper. Notes: Beets are earthy and rustic, and the fresh brightness of the blueberries goes really, really well with them. We loved this dish. Put your chicken in a bag with the rest of the chicken ingredients and marinate for about 30 minutes while you prepare the rest of the meal. In a large bowl, mix the sauce ingredients: coconut aminos, garlic, ginger, almond butter, lime juice, fish sauce, and red pepper flakes. Set aside. Divide your zucchini among serving dishes. 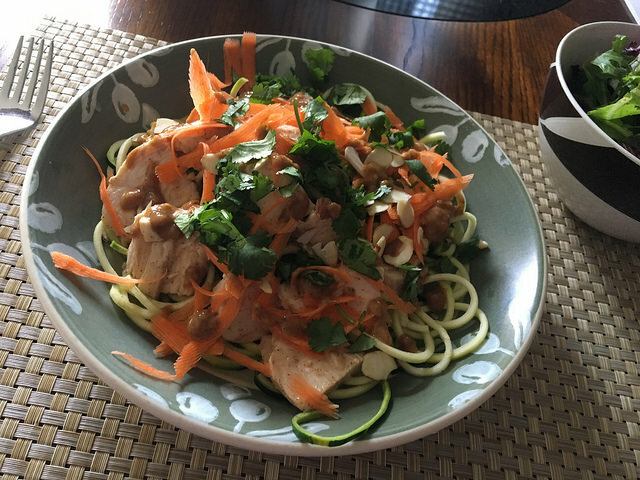 Top with the chicken (shake off extra marinade), carrots, almonds, and cilantro , and drizzle on 1 to 2 Tbsp. sauce before serving with a wedge of lime. Notes: This is one of those dishes that we thought would be weird, but it was delicious. We served it room temperature and that was perfect. Really excellent. In a large, non-reactive bowl, cover the fish with the lemon and lime juice. Stir, then add half the onion. Cover and refrigerate for 4 to 6 hours, until the fish is completely opaque. Stir halfway through marinating to make sure everything gets covered with juice. Remove the fish from the fridge and drain the marinade away. In a clean bowl, combine the fish with the rest of the onion, garlic, jalapeno, bell pepper, and salt and pepper to taste. Serve topped with the minced green onions, and some plantain chips. Lay chicken on a plastic cutting board, and cover with plastic wrap. Pound the pieces out to get them as thin as possible. Season the pieces with salt and pepper. In a large skillet over medium heat, melt the butter and heat it with the olive oil. When it's hot, saute half the chicken in a single layer until it begins to brown, about 4 minutes on each side. Add half the lemon juice, half the broth, and half the capers. Cover the pan and cook for 2 more minutes. Transfer the chicken to a serving plate. Repeat for the rest of the chicken. Saute the mushrooms in the same pan for about 5 minutes. Serve the chicken topped with the mushrooms and sauce. Notes: We haven't tried this yet. I think we'll have it over zoodles. Cut watermelon into 1-inch thick slices. Squeeze lime juice all over the watermelon. Heat a grill to medium heat. Place watermelon on grill for 5 minutes per side. Cut the feta into 1-inch think slices. Assemble on a plate, alternating with watermelon and feta. top with arugula. Drizzle with balsamic glaze, and sprinkle with salt. Preheat oven to 425 degrees. Place the peppers, onion, and garlic on a parchment-lined baking sheet, and drizzle with olive oil. Roast in the oven for 45 minutes, removing garlic after 30 minutes. When veggies are done, put them in a food processor with the rest of the Romesco ingredients. Pulse until well-combined, leaving some texture to the sauce. Set aside. Coat the eggplant with olive oil. Heat a grill to medium-high heat. Place the eggplant on the grill and cook for 5 minutes on each side. When the eggplant is done, assemble each slice with a smear of Romesco, some crumbled feta, and a sprinkle of basil. Notes, we haven't tried this yet. Preheat oven to 350 degrees. with rack in middle position. Use a paper towel to grease a 12-cup muffin tin with 1 Tbsp. melted ghee. In a large bowl, mix together the rest of the ingredients, including the remaining ghee. Try to keep the chunks of fish intact as much as possible. Season with salt and pepper. Scoop 1/4 cup of mixture into each muffin cup, and flatten with a spoon. Bake for 20 to 25 minutes, until a toothpick inserted comes out clean. Transfer the cakes to a wire rack to cool. If you want to crisp them up, pan-fry them in melted ghee over medium heat until the edges are crispy. In a large bowl, mix together the salmon, mayo, green onions, eggs, parsley, onion, 1 Tbsp. coconut flour, paprika, dill, salt, dried mustard, garlic powder, and pepper. Divide the salmon mixture into 8 equal portions, and form a patty that's roughly 3 inches in diameter and 3/4 inches in thickness. Place the cakes on a parchment-lined plate, cover, and chill in the fridge for about 30 minutes to firm up the cakes. When ready to cook, put the remaining coconut flour in a shallow dish, and lightly coat the cakes, shaking off any excess. Heat the ghee over medium heat in a large skillet, and fry the cakes for 2 minutes or until golden brown, flipping once. Drain on a wire rack before serving with remoulade and lemon wedges. Notes: My favorite salmon patty recipe is this one, but since we're off dairy and peas for now, we needed to find a suitable substitute. This version is pretty good, but I think it would have been better if we chilled the salmon patties even more. The flavor was very good, but the texture was a little soft. We will likely make it again, though, and will tweak the chilling and fry time. Bring a large pot of water to a boil, and put some ice and water in a large bowl. Cut a small X in the bottom of each tomato and blanch in the boiling water for 30 seconds. Remove to the ice bath, and let chill for a minute or two, then peel the tomatoes. Core and rough-chop them, reserving all the juice and seeds. Finely dice 1/3 of the cucumber and set aside. Rough chop the rest of the cucumber, and toss the rough-tossed cucumber, tomatoes, shallots, bell pepper, and cilantro into a blender. Puree until the veggies are liquefied. Add the watermelon, vinegar, olive oil, salt, and pepper flakes to the pureed veggies and blend until smooth. Taste, and season as necessary. Refrigerate the soup in the blender cup for at least 4 hours. Just prior to serving, blitz the mix in the blender once more to combine again. Serve soup in bowls, and top with a drizzle of olive oil, reserved diced cucumber, and fresh cracked black pepper. Preheat oven to 350 degrees, with the oven rack in the middle position. Line a baking sheet with parchment paper. Arrange the prosciutto in a single layer on the baking sheet. Don't overcrowd the pan, or the pieces won't get crispy. Bake for 10 to 15 minutes, or until crunchy. Make sure they don't burn. They will crisp up as they cool, so it's better to under-bake than over-bake. Transfer the chips to a wire rack to cool. Stir all ingredients together in a bowl until smooth and thoroughly combined. Store in an airtight container in the fridge - it will keep for up to a week. Notes: This was just okay - not nearly as much flavor as we expected, given the ingredients. Store in an airtight container in the fridge - will keep for up to a week. Pulse the mushrooms in a spice grinder until finely ground. Transfer to a bowl, and add in the other ingredients. Stir to combine. Store in an airtight container - this will keep for several months. Chop off the woody bottom parts of the asparagus and get rid of them. Lay the asparagus on a baking sheet and coat with olive oil. Whisk together the mustards and horseradish. Pour the mixture over the asparagus and rub it in with your hands. Roast the asparagus for 15 to 18 minutes, until soft but not mushy. Toss halfway into cooking. Meanwhile, peel the plantains (you might have to cut score the peels to get them off, and roughly chop them. Put the plantains and garlic cloves in the boiling water and cook until soft, about 10 minutes. As the plantains boil, make the chimichurri by combining all the ingredients in a food processor and blending until pretty smooth. Drain the water from the plantains and add in the chicken stock. Use a potato masher to mash the plantains, garlic, and chicken stock until smooth. Swirl in the chimichurri, and serve immediately. If you need to reheat, add a bit of chicken stock to thin it out a bit - it will thicken as it cools. Preheat oven to 400 degrees. line a baking sheet with aluminum foil, and top with a rack from a roasting pan. Combine all burger ingredients in a bowl, and season with salt and pepper. Shape meat into four patties and place on roasting rack. Bake the patties until the burgers are cooked through - about 20 minutes. Make the slaw while the burgers are cooking. Cut the mangoes, peppers, and cucumbers into thin strips and place in a large bowl. Add the onion, lime zest and juice, coconut aminos, mint, curry paste, and season with salt. Let marinate for about 15 minutes. Serve the burgers with the slaw on top. Peel and quarter the celery root. Use the grater attachment of a food processor to grate the sections. Heat some ghee in a large saute pan. Add the grated celery root and cook, stirring frequently, for about 5 minutes. Continue stirring and add in about 1/3 c. chicken stock. When the stock is mostly absorbed, stir in another 1/3 cup. Continue to add in 1/3 cup increments until the root risotto has reached a creamy consistency and is soft when tasted, about 10 minutes. You may or may not need all of the stock - just taste as you go and stop adding it when the texture is right for you. Combine all ingredients in a bowl with a whisk. Set aside. In a large saute pan with a lid, melt a few tablespoons of ghee over medium heat. Add the onions and potatoes, and cover with the lid. Stir occasionally, and cook until the onions and potatoes are cooked and you can pierce the potatoes through with a fork. Add the smoked salmon and asparagus, and a bit more ghee, and simmer uncovered. Cook, stirring occasionally, until the mixture is a bit crispy with crust and everything is warm and cooked through. Add the vinaigrette to the pan, stir, and serve. Notes: We haven't tried this one yet. Rub the spice blend all over the ribs. Vacuum-seal the ribs, and let sit in the fridge overnight (at least 12 hours). Preheat your sous vide cooker to 145 degrees. Add the ribs to the water bath, and cover with Press-and-Seal or aluminum foil. Cook for 36 hours at 145 degrees. Remove the ribs from the bath. Heat a grill until it's blazing hot. Slather BBQ sauce all over the ribs. Grill for 5 to 7 minutes on each side, until the sauce is cooked onto the ribs. Notes: Amazing texture and flavor here, and incredibly simple. Heats well the next day, too. If you don't want to BBQ your ribs right away, put them in an ice bath right out of the sous vide, and leave them in the bag in the fridge until you are ready to serve. You'll want to heat them on the grill for a few more minutes. Melt the ghee in a large skillet over medium heat. Add the apples and pecans, and cook until the apples are tender. Add the cinnamon and nutmeg, and season with salt to taste. Make the salsa by combining all the ingredients together in a bowl. Season with salt and pepper to taste, and set aside so all those flavors can get friendly with each other. THOROUGHLY DRY THE SCALLOPS. I mean it. They must be d-r-y or they won't turn out well. Use paper towels, then some more paper towels.Season the dry scallops with salt and pepper. Heat the ghee in a large cast-iron skillet over medium-high heat. Add the scallops to the pan, but make sure they have plenty of room and aren't touching. Do it in batches if you have to. Cook on one side for about 1 1/2 to 2 minutes, depending on how thick your scallops are. Don't move them. Don't even peek. When they are a bit opaque (not shiny) up the side about a third of the way up, use tongs to flip them over. Cook on the other side for another 1 1/2 minutes or so, and remove from the pan immediately. Let the scallops rest for 1 minute. Serve with the tropical salsa. Notes: The salsa is fresh and cool against the buttery, warm scallops. Terrific. The salsa works on all sorts of other protein, too - salmon and chicken in particular. Pat the salmon dry with paper towels, and season with salt and pepper. Brush a bit of oil on both sides, and place in a cast-iron skillet. Bake until salmon is cooked through, about 12 to 15 minutes. 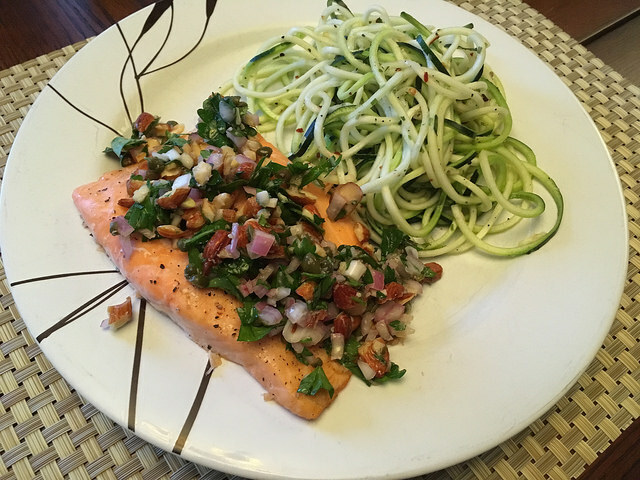 While the salmon is baking, prepare the salad: combine the shallot and red wine vinegar in small bowl, and let sit while you prepare the rest of the ingredients. Roughly chop the capers and parsley. Put the almonds in a zip-lock bag and use a heavy object (like a chicken pounder, or a can) to break the almonds into chunky pieces. Add the capers, parsley, and almonds to the shallots, and drizzle in some olive oil. Taste, and add olive oil until the salad is just coated and it all tastes good. Serve the salad on top of the salmon. Notes: This was outstanding. So complex and flavorful. We served it with some zucchini noodles tossed with lemon juice, olive oil, salt, and red pepper flakes. Everything went perfectly together. Big winner! In a stockpot, melt the ghee over medium heat. Add the squash, cauliflower, and onion and cook until slightly softened, stirring occasionally, about 8 minutes. Add the wine to deglaze the pan. Simmer for 3 minutes. Add the stock and water and bring to a boil over high heat. Reduce heat to medium-low and cover. Simmer for 60 minutes or until all the veggies are really soft. Use an immersion blender, or a blender (in batches) to puree the soup until smooth. Season with salt and pepper, and continuing simmering the pureed soup as you prepare the bacon. Fry the bacon until crispy, and drain on paper towels. Serve the soup with the crumbled bacon on top. Using a double-boiler or heatproof bowl over a saucepan, bring 1 cup of water to a boil (in the bottom pan). In the top pan or bowl, whisk the egg yolks together with the lemon juice until blended. Place the pan or bowl over the simmering water and gently whist while the egg yolks warm. Make sure the water in the bottom pan never touches the vessel with the yolks, or the eggs will scramble. When the yolks are warm (about 3 minutes), slowly pour the melted ghee into the egg yolks, whisking constantly. Continue whisking until ghee is fully incorporated, and the sauce is thick enough to coat the back of a spoon. Immediately remove from heat and whisk in the salt, pepper, and cayenne. Serve immediately. Boil the sweet potatoes for 10 minutes until cooked through. Place the cooked potatoes, 2 Tbsp. ghee, coconut milk, salt, pepper, and garlic powder into a food processor and process until smooth, stopping occasionally to scrape the sides of the bowl, if necessary. Garnish with remaining 1 Tbsp. ghee, and additional coarse salt, cracked black pepper, and cinnamon. if desired. We served this with cucumber red onion salad, and leeks sauteed in ghee. I had some raw cashews on the side, too. Cut the grapefruit into supremes (see http://thehealthyfoodie.com/grapefruit-and-ginger-tuna-tataki/ for detailed instructions). Place the fruit into one bowl, and squeeze the juice from the remaining grapefruit part into another bowl. Put the supremes in the fridge until ready to use. Add all the marinade ingredients to the bowl with the grapefruit juice and set aside. Dry off the tuna steaks with paper towels and season them with some salt. Melt the coconut oil in a non-stick skillet over high heat. When it's super hot, put the tuna in the skillet and sear for about 1 minute per side - until a crust forms and the meat turns opaque about 1/4-inch up the side of the steak. Remove the steaks to a dish that's just big enough that they steaks can lay flat, and pour over the marinade. Cover the dish and refrigerate overnight, turning once or twice the next day. When you're ready to eat, slice the tuna steaks into 1/4-inch thick slices. Serve with the grapefruit supremes and marinade as a dipping sauce. Notes: Wow. This was outstanding. 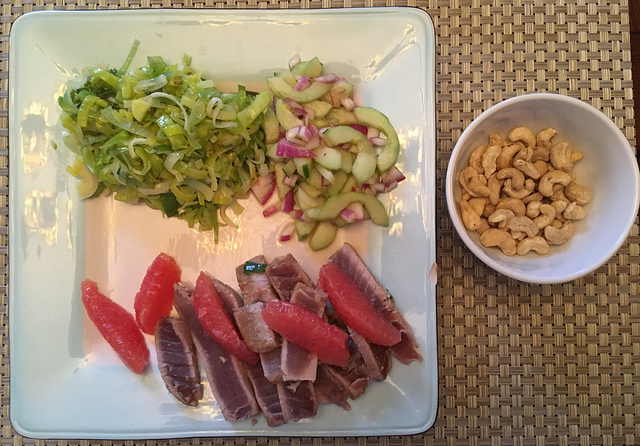 The tuna gets such a good flavor from the marinade, and it's really easy to make. I loved it with sauteed leeks, because the rich warmth of the leeks and ghee went perfectly with the cool cleanness of the tuna and salad. Mix the ground turkey and pork in a bowl. In another small bowl, mix the curry powder, ground basil, ground ginger, garlic powder, and almond flour. Add this mix to the meat and mix well. Add the egg and mix well. Form meatballs into 1 to 1.5 inch diameter balls, and place on a large baking sheet. Bake for 20 minutes. While the meatballs are baking, heat a large skillet over medium-high heat. Add the coconut oil, then the chopped veggies, garlic, and ginger. Cook for 5 to 7 minutes, until soft. Add the curry paste, then all of the coconut milk. Reduce heat and simmer for 10 minutes. Season with fish sauce and salt. When the meatballs are done, add them to the sauce and cook for another 5 minutes or so. You will probably have more meatballs than you need, so freeze some for a quick meal down the road. Add the cilantro, and finish off with a squeeze of fresh lime just before serving. Serve over zoodles, cauliflower rice, spaghetti squash, or just eat some meatballs and sauce by themselves. Notes: Delicious and filling. Lots of great flavors. Love it over zoodles. Peel the plantain and mash it with a potato masher in a bowl. Add the tapioca flour and cinnamon, and mix well. You want to make sure there are no large chunks of plaintain, but smaller chunks are fine. Heat a non-stick skillet over medium heat. Add a couple of tablespoons of cooking fat and wait for it to get hot. Using 2-3 tablespoons for each patty, drop the plantain mixture into the skillet and fry for about 2 minutes on each side, or until lightly brown. Remove to a paper towel to get rid of extra oil, and eat up. Notes: The non-stick skillet is necessary - otherwise these things stick like you wouldn't believe, and you'll just end up with a pile of sticky, hot mush. But when they are cooked right, they are really delicious - sticky and sweet. Some heat would help tame the sweetness, so we may add a jalapeno to the mix next time. 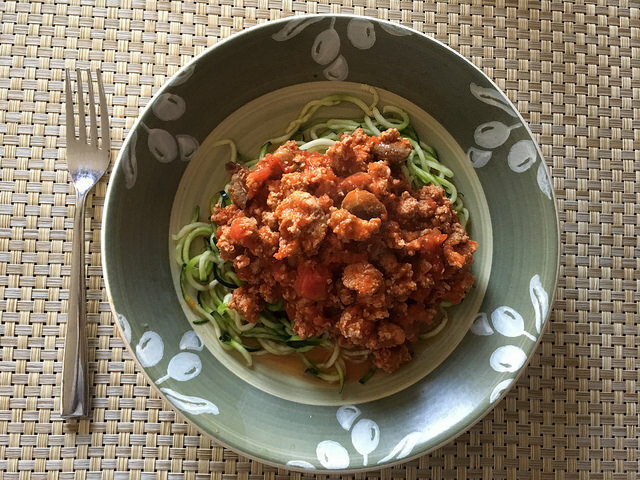 You need a spiralizer for this recipe. Peel the potatoes, and cut the ends off so they will fit on a spiralizer Using the largest spiral blade (not the slicing blade - the middle one), spiralize your potatoes. Put the potato noodles on a baking sheet and drizzle with olive oil, salt, and pepper. Rub the noodles around with your hands to distribute the seasonings and oil evenly. Put potatoes in oven and bake for 25 to 30 minutes. At 25 minutes, remove any potatoes that are turning brown to a paper-towel lined plate. Keep checking the noodles every minute or so, and take out the done ones. They should all be done within 30 minutes. Let sit on paper towels for 5 minutes - this will help them get even crispier. 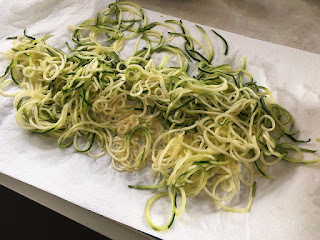 Using a spiralizer (like this one from Amazon), make thin noodles out of your unpeeled zucchini. Spread zucchini noodles in a single layer on some paper towels. Sprinkle generously with salt, and top with more paper towels. Leave alone for about 20 minutes, pressing lightly on the towels every few minutes to soak out released water. Meanwhile, brown the ground turkey in a large stock pot, and season lightly with salt and pepper. When the turkey is done, add in the mushrooms and cook until the mushrooms are a little tender, but not mushy. 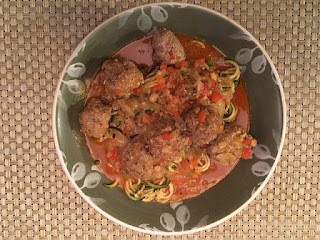 Stir in the sauce and bring to a boil, then simmer as you finish the zucchini noodles. Heat a little olive oil in a saute pan over medium heat. Rinse the zucchini noodles thoroughly with water, and pat dry to remove remaining moisture. Add the rinsed and dried noodles to the saute pan and gently saute for 1 to 2 minutes, until the noodles are heated, but not limp. You don't want to cook them, just heat them. Divide zucchini noodles between two plates and top with a generous scoop of sauce. Notes: This tastes just like the best spaghetti you've ever had. Make sure the sauce is nice and thick - watery sauces don't work here. Freeze the rest of the sauce for an easy dinner some other time. Heat the ghee in a large frying pan over medium high-heat; add a splash of olive oil to prevent the ghee from burning. Season scallops with salt and pepper add them to the pan, without overcrowding. Cook scallops in two batches; if they touch they will steam rather than caramelize. Cook, without moving the scallops, until the bottoms are a rich golden brown, 2 minutes on each side. Turn the scallops and cook on the second side for another 1-2 minutes. Pour broth into a medium-size pan, add squash and potatoes, and make sure that the liquid covers the vegetables. Season with salt and bring to a boil. Reduce the heat, cover with the lid and simmer until potatoes are tender. Remove from heat. Transfer squash and potatoes into a blender. Add 1/2 teaspoon salt, ghee, and pepper. Blend until smooth. Keep warm. 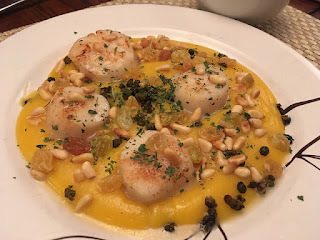 Scoop some puree on a plate and top with 4 scallops. Drizzle with a little olive oil. Sprinkle the pine nuts, raisins, capers and parsley on the puree. Notes: Easy and elegant. So many textures. Very rich-tasting. Loved it. Put all ingredients in a saucepan over medium-low heat. Cook for 15 minutes. Remove from heat and puree in a blender (remember to vent the steam or you'll have a huge mess). Store in fridge in jars for up to 2 weeks. 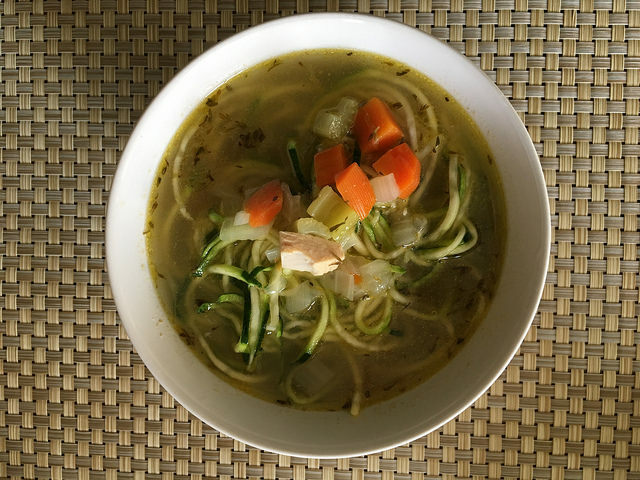 Notes: This is one of those recipes that changed the way I think about processed foods. It only takes about 20 minutes to make ketchup that is leaps and bounds better than any I've ever had in a store.